Punxsutawney Phil saw his shadow this morning…..so……. that means 6 more weeks of winter! It’s also Concoction Friday Nation! Today……I’m talking about how healthy Peanut Butter is! Become a member of Weight Loss Nation Tampa Bay today….for only $20.18 a month for the next 12 months! Today’s show is sponsored by Allison Hollister – Licensed Massage Therapist, who specializes in Therapeutic Bodywork Therapy in Tampa, FL. If you are in PAIN, and you cannot move your body…..YOU need to call Allison Hollister. She will get rid of the source of your pain, so you can start doing activities that you love to do! Peanut Butter is one of my favorite satisfying foods to eat. Today, we take it for granted on how easy it is to go from the thought of… ”I feel like eating some peanut butter” ……… to either walking into the kitchen and opening up a jar or having it delivered to your door within 2 hrs. by ordering a jar on Amazon Pantry. In 1884, Marcus Edson developed a process to make peanut paste by “milling” roasted peanuts between two heated plates. A year later, The famous cereal maker, Kellogg, received a patent for a technique he developed for making peanut butter with raw peanuts in 1895. Dr. Straub is responsible for patenting a peanut butter making machine in 1903. Peanut butter was introduced to audiences at the 1904 Universal Exposition in St. Louis at C.H. Sumner’s concession stand. Now….96 years later… the man responsible for bringing us peanut butter the way we know and love today… was Joseph Rosefield. In 1922, through homogenization, Rosefield was able to keep peanut oil from separating from the peanut solids. The rest they say……..is history! Have you ever heard someone say……”They get along like oil and vinegar! What that means….is that oil and vinegar generally don’t mix well together. That’s why most Milk is HOMOGENIZED. The physical process breaks down the fat molecules in cream into smaller ones, so that the smaller fat molecules can spread evenly throughout the milk. This allows the cream and milk to stay together. The same thing is done with Peanut Butter. HOMOGENIZATION allows the oil in peanut butter to mix with the crushed peanuts. Rosefield later sold the patent to a company that began making Peter Pan peanut butter. Rosefield decided to go into the Peanut Butter business for himself …..selling the Skippy peanut butter brand through his Rosefield Packing Company. NOW……let’s take a look at different kinds of Peanut Butter. I grew up on Skippy Peanut Butter or Jif Peanut Butter. Whichever my mom had a coupon for. Now that I’m living a healthy lifestyle…..regular Skippy or Jif Peanut Butter wouldn’t be one of the healthiest choices to make. Here are the ingredients…… Roasted Peanuts and Sugar. Contains 2% or less of……Molasses,.,,Fully Hydrogenated Vegetable Oil …..which means hydrogen is added to break down the fat molecules to produce a more solid saturated fat. The process of Fully hydrogenated produces NO TRANS FATTY ACIDS, which is less harmful to your body than Partially hydrogenated fats. The serving size is 2 Tablespoons. There are 190 calories per serving. Total Fat is 16gms Contains 2.5 gms of saturated fat & there are NO Trans Fat. Saturated fats are simply fats that stay solid at room temperature. We see mostly saturated fats in animal fat. The marbled fat you see in a steak or the fat on a piece of chicken. Trans fats, which are also known as Trans Fatty Acids, when Hydrogen is added to the oil to help make it a solid. You see Trans Fats in Margarine or Crisco Oil. There is NO Cholesterol …..one serving has 105mg of Sodium. There are 8gms of Total Carbs…….there are 2gms of Fiber ……and……3gms of Sugar, which is ADDED. Each serving contains ….20% Niacin…..10% Vitamin E …..4% Iron….and…..2% Riboflavin. Since the Jiff Peanut Butter is Fully Hydrogenated…..you do not have to refrigerate it. You can store it in your pantry and the peanut butter will stay solid. Now……let’s look at my favorite peanut butter. I LOVE the brand “Once Again” The Once Again Company began in 1976 in rural Nunda, NY. The company is “Employee-Owned” I LOVE THAT! Here are the ingredients: Dry Roasted Blanched Organic Peanuts, Salts. That’s it. That’s the ingredients Peanut Butter should have ……Period! No Fully Hydrogenated Vegetable Oil…….so that means the Oil and Peanut butter IS separated. You will need to “Stir” the Peanut Butter to mix the oil and peanut butter. I refrigerate the peanut butter after stirring and that helps keep the peanut butter a solid. Now for the nutritional value ……. There are 201 Calories per serving. There is NO Cholesterol and each serving has 50mg of salt. There are a total of 7gms of carbs…….2 gms of Fiber ….and…..2 gms of sugar. There is 9 gms of Protein! If you would rather shop and buy “Once Again” Peanut Butter at a local supermarket near you…….. you can buy it in a Whole Foods market or Sprouts…..or in a local Health Food store near you. If you are looking for a more “familiar” brand of Peanut Butter that is healthy for you…..I found that “Smuckers” Natural Creamy Peanut Butter” will pass the test. Smuckers Natural Creamy Peanut Butter. Made with no hydrogenated oils, this is the best mainstream brand of peanut butter on the market. You can find it any supermarket. Eat Peanut Butter every day if you want. ONE Tablespoon right out of the jar always satisfies me …….. or you can put ½ to 1 Tablespoon into a smoothie. In order to celebrate National Peanut Butter Day and EVERYDAY you want Peanut Butter……..grab a healthy jar and eat a Tablespoon Full! Ready to join Weight Loss Nation Tampa Bay! For a limited time, you can join Weight Loss Nation Tampa Bay for only $20.18 a month for the next twelve months. After Valentine’s Day……the regular monthly price of $39.99 is in effect. You can also join as a “Lifetime Member” of Weight Loss Nation now…for a one time fee of only $299.00! After Valentine’s Day…….which is February 14, 2018…..the price goes back up to its regular price of $449.00! 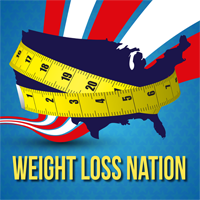 As a Weight Loss Nation listener, we are celebrating the Launch of Weight Loss Nation Tampa Bay! You can email me at Support@WLNTB.com and tell me you want to become a Weight Loss Nation Tampa Bay Member. Put the secret code – TAMPA2018 into the email and I’ll make sure you join Weight Loss Nation Tampa Bay for just $20.18 a month, for the next 12 months! Join us and join the community that LIVES a Healthy Lifestyle for Life! THAT’S IT FOR TODAY WLN! UNTIL NEXT TIME……HAVE YOURSELF A VERY HAPPY, HEALTHY & PROSPEROUS WEEK!